BBC NEWS | UK | What if D-Day had failed? How were the huge risks involved in D-Day overcome, and if the D-Day landings had not succeeded, what kind of a Europe would have prevailed? D-Day success was no sure thing and failure would have meant military and political catastrophe. No-one knew this better than the Supreme Allied Commander, General Dwight D Eisenhower. On the night of 5 June, after he'd given the final order for the Allied invasion to proceed, he took a scrap of paper from his pocket and wrote out the text of the press release he hoped he'd never have to give. It read as follows: "Our landings have failed to gain a satisfactory foothold and I have withdrawn the troops. "My decision to attack at this time and place was based on the best information available. "The troops, the air and the Navy did all that bravery and devotion to duty could do. "If any blame or fault attaches to the attempt it is mine alone." Then he put it in his pocket and forgot about it. What if he'd had to use it? How close disaster came is revealed by what did happen. Eisenhower had already been forced to postpone D-Day by 24 hours because of bad weather. 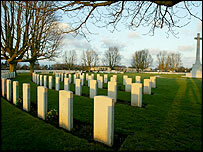 It had been fine in late May during the final build-up of Allied troops. But then it rapidly deteriorated until on 4 June Eisenhower decided he had to put things on hold. However, he knew that there were only two more days left that week with the right combination of moon and tide for the landings to proceed - otherwise, he'd have to postpone everything for another two weeks. Fortunately, a temporary break in the weather allowed the invasion to go ahead on the 6 June. Any further postponement would have risked the Germans finding out. As it was, they were taken completely by surprise. This was crucial. Any inkling of where and when the Allies were going to land would have certainly produced disaster, enabling the Germans to bring the full force of their fire to bear at the very moment that Allied forces were at their most vulnerable, as they landed on the beaches. Key to this Allied surprise was extreme secrecy, aided by a brilliant deception campaign that convinced Hitler that the main thrust of the attack would be in the Pas-de-Calais area - not Normandy - and at a later date. So successful was this deception that when allied troops did land in Normandy, Hitler was convinced it was a feint and held back vital troops he would otherwise have used. 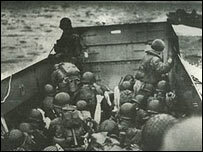 Even so, disaster almost struck at Omaha Beach, where American forces encountered murderous fire and were mowed down in their hundreds as they left their landing craft - a scene powerfully evoked in the opening shots of Steven Spielberg's film, Saving Private Ryan. For a while, it seriously seemed that the Americans might have to withdraw. This scene would have been multiplied tenfold had Allied secrecy been compromised. Delaying the landings much longer would almost certainly have resulted in such a disaster. And then? With Allied forces in disarray, and the Wehrmacht on full alert, no repeat invasion could have been tried again that summer and the Allies would have had to wait another 12 months. Meanwhile, Hitler would have focused all his attention on the Russians in the East, although to no avail. The Red Army by now was unstoppable and eventually Stalin's forces would have not just taken Berlin, as they did, but advanced further west to the Rhine, and perhaps even to the North Sea and English Channel. The whole of Germany and western Europe would then have been behind the Iron Curtain, and communism would have been enforced on the end of bayonets. In a repeat of 1940, Britain would have again stood alone, except for the United States and its overseas allies. In these circumstances, the US might well have retreated across the Atlantic into isolation, and Britain forced into some disastrous compromise deal with Stalin. The whole post-war history of Britain, of Europe, and of the world, would have been radically different. By knowing what DID happen back in June 1944, we can see very clearly how close we came to experiencing a very different history altogether.